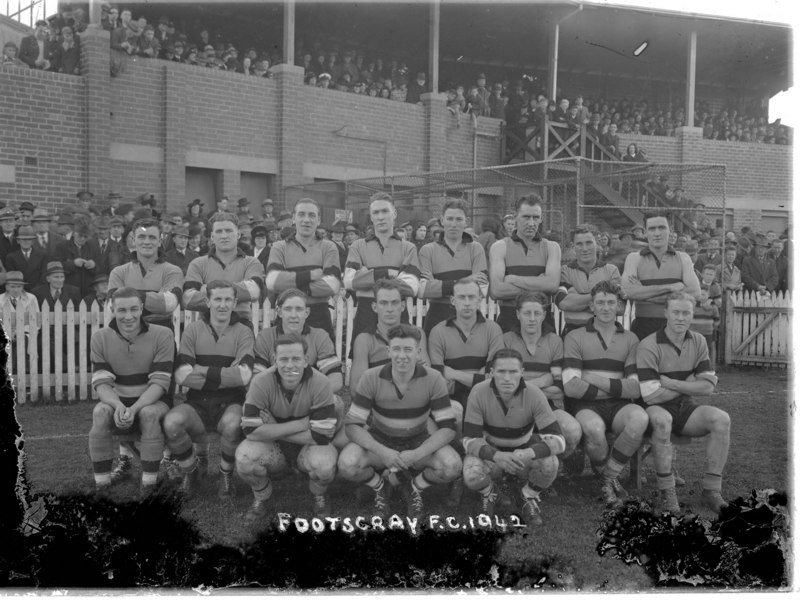 A good quality photo of the Footscray (VFL) Senior Team of 1942. The shot was taken at Yarraville Oval, the Bulldogs home ground in 1942. The exact same photo (presumably therefore the work of Boyles) appears on Page 143 of the Footscray history book published thirteen years ago. See J. Lash, C. McConville, M. Small, D. Wright (joint authors), Unleashed - A History of the Footscray Football Club, Aus-Sport Enterprises, 1996. The authors identify all players in the photo. Footscray finished fourth in an eleven team competition (without Geelong) and were beaten by South Melbourne in the semi-final. Note that Jim Thoms appears in several Boyles images of RAAF teams (for example SLV photo 122/241 - second from right in front row). Note Army slouch hats in crowd. Emulsion damage across bottom but no players obscured. Tom Tribe's brother George Tribe also played for Footscray's senior team during the forties but is much better known as a cricketer. He played three test matches for Australia. Ambrose Palmer achieved fame as a boxer and a boxing trainer. Charles Boyles left us with a photo of the Hawthorn senior team 122_168 - Hawthorn Senior Team 1942 taken at Brunswick Street (Fitzroy) on the very same day as he took this photo at Yarraville. It is obvious that the former photo was taken pre-match and the latter photo at the half-time interval. Notice the mud on the Bulldog legs. Taking a single photo at each of two grounds seems odd. One imagines Boyles could more easily have stayed at the one ground and photographed the opposition team at half-time . The Bulldog's Hall of Fame display at Whitten Oval uses a Harry Hickey photo cropped from this Boyles photo.